Weary of following her gold-hungry father in 1890s Montana, Emily Carver longs for tenderness, love, and a stable home. Escaping the pain of his past, young geologist Caeden Thibault comes to Montana to catalogue its minerals. Will he and Emily allow God to bring healing to their hurting hearts? About "A Treasure Concealed (#01 in Sapphire Brides Series)"
Caeden Thibault, a young geologist, comes to Montana to catalog minerals indigenous to the state. He's a serious and guarded young man trying to escape the pain of his past. He has avoided all romantic entanglements, fearing he might become like his abusive father. But something about Emily Carver has caught his attention, something he never expected... . 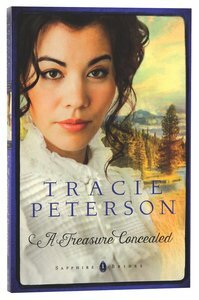 Customer Reviews For "A Treasure Concealed (#01 in Sapphire Brides Series)"
An interesting take on the 'saving yourself for your husband', idea. Also, cool presentation of faith before sight.